This blanket is a great one for making doll blankets with because it is so very easy to adapt to whatever size you need. In the photo below I have placed it on my tiny doll. This doll is 7.5 inches tall and is the type that can be purchased very inexpensively at craft stores. If you would like to make the nightgown she is wearing Look Here. By changing the weight of the yarn and the size of the needles you can change the size of the blanket. It is also possible to use the same size needles and yarn, but keep working the pattern longer, to make a larger blanket. 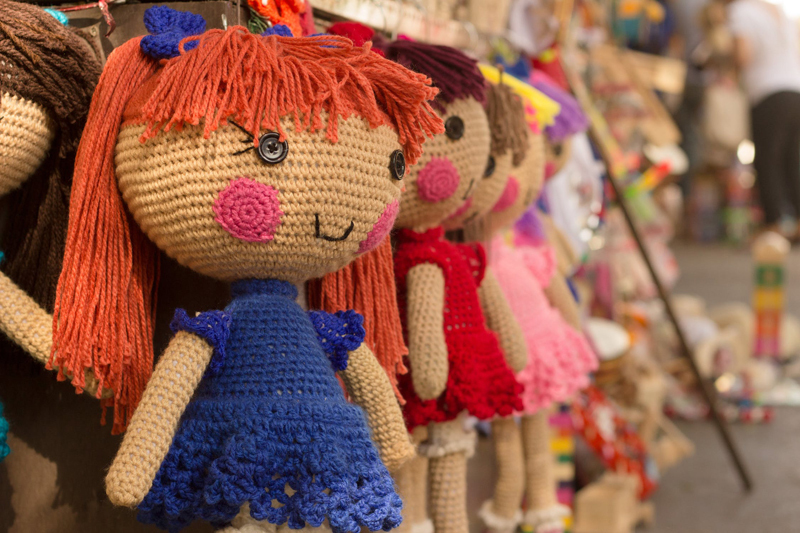 If you make a blanket for small dolls this is also a great way to use up yarn that you have left over from another project, because it requires a small amount of yarn. I used baby sport yarn, just a small amount, probably less than .25 of a 5 ounce ball. Read through the directions before beginning to knit. Row 2. Knit 1, yarn over, knit remaining stitches. Repeat row 2 until there are 40 stitches on your needle. Hint when you get to the end of the row knit in the back loop of the yarn over from the previous row to avoid any loops in the finished product. When there are 40 stitches on the needle, knit one row even. Row 3. Knit 1, knit two together in the back of the stitches, knit remaining stitches. Row 4. Repeat row 2. Repeat rows 3 and 4, four more times. Repeat row 3 only, until there are three stitches remaining on needle. Knit one more row even. Bind off last three stitches. Weave in ends of yarn. You can also make a shawl for your doll by following the pattern until you have 40 stitches on your needle and then bind off.